Thank You for Your Blood Donations in November! 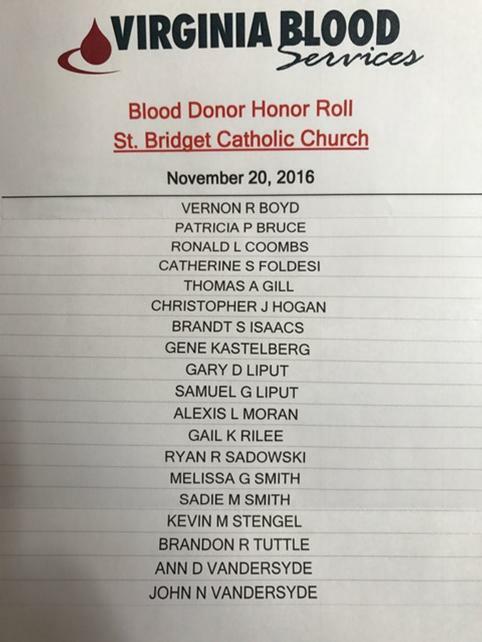 Thank you to all parishioners who gave blood in support of our November Blood Drive. Your donation makes a difference, and actually saves lives – what an amazing gift to offer, and no more fitting than at this time of year. Our next Drive will take place February 19, 2017. The Knights of Columbus in the Richmond area have provided a Christmas Eve dinner for the patients at the McGuire Medical Center for over 30 consecutive years. This would never be possible without the dedicated support of the Knights of Columbus Councils and Assemblies. This year we are scheduled to serve on Friday December 23 (the Eve before Christmas Eve). Arrive by 2:00pm! We have yearly provided an extra spark for Veterans confined to the hospital during this time when they would rather be home with their families. We provide a Christmas Dinner of Turkey, Roast Beef, Ham, Shrimp Cocktail, Potato Salad, Coleslaw, Cheese, Soft Drinks, Fruits and Deserts. Prior to dinner, the Fourth Degree Posts the Colors, and the Chaplain will ask God’s Blessing. In keeping with military tradition, we will present a custom made cane to the oldest and youngest veteran patient in the hospital provided by Brother Oscar Devere Morris of Free Canes For Vets. Knights and Families serve dinner to the Veterans that can not leave their rooms, Knights and families are in the serving line, Knights and Families assist Veterans in wheelchairs, a group sings Christmas Carols, a group provides background music, a gift is provided to each veteran and a Christmas Card is provided to everyone. In order to make this a successful day we need many helpers, each council and assembly is asked to bring at least 3 people to work. Thank you for including hospitalized veterans in your Christmas plans! Update – March for Life in Washington, D.C. Please spread the word to the K of C and Men’s Ministry and anyone else you can think of. The March for Life in Washington, D.C. will be held on Friday, January 27, 2017. This will be a very important witness to the new Administration. On Tuesday, January 24 @ 7:00 p.m. a vigil Respect Life Holy Hour will be prayed at St. Bridget Church in support of our pro-life efforts. The Holy Hour will include Exposition of the Blessed Sacrament and Benediction, scripture readings and reflections,hymns, and time for silent prayer. Please plan to attend.